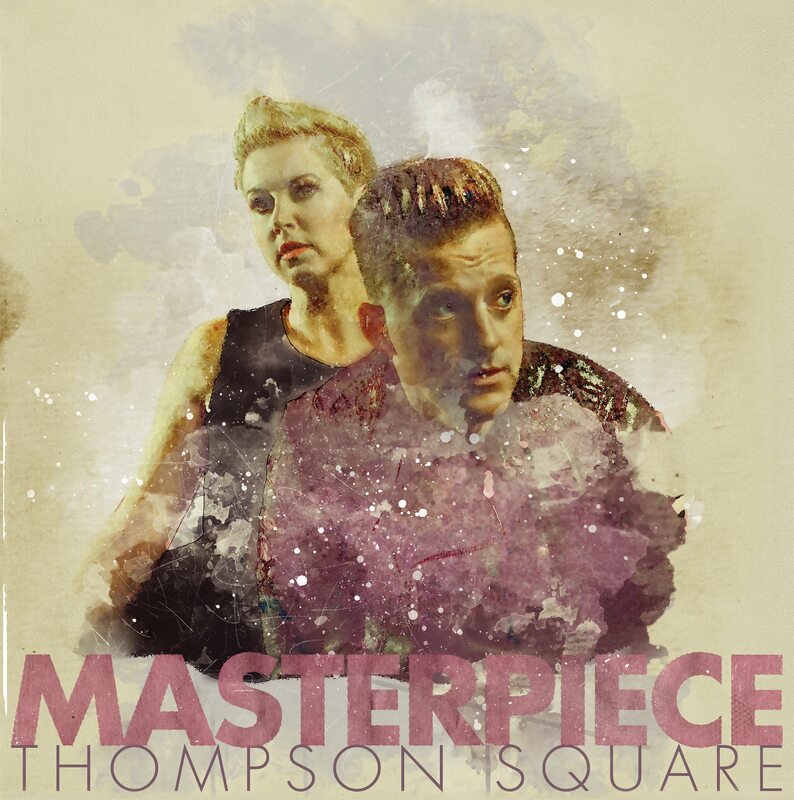 Fans and critics agree, MULTI-PLATINUM, 2X GRAMMY nominees THOMPSON SQUARE have created a true “work of art” (Sounds Like Nashville) with their third studio album, MASTERPIECE. Debuting at #3 on the influential iTunes Country Albums chart, MASTERPIECE marks the duo’s first full-length LP in more than five years as married couple Keifer and Shawna Thompson mix carefree fun with deeply-personal themes. Digging into a family life which now includes their young son, Cooper, the project has been hailed by a wide range of critical tastemakers just one week after its long-awaited launch. Keifer and Shawna also took their MASTERPIECE to network TV, chatting about the album’s inspiration on Fox & Friends and performing standout tracks like “A Love Like This” and “Good Day” as part of the national broadcast’s All-American Summer Concert Series. The Hallmark Channel also featured the duo for a sit-down interview on Home & Family. Following up, THOMPSON SQUARE made a series of fun filled release-week appearances during Nashville’s CMA Fest, including a pop-up show at Legends Corner, the 2018 Concert for Love and Acceptance at Wildhorse Saloon, and a Spotify-programmed concert at Ole Red – plus their super-sophisticated Masterpiece at the Museum fan-club party, held at the Frist Art Museum. Available everywhere now, MASTERPIECE includes 11 brand-new tracks and finds the chart topping Country duo looking for inspiration in their own fairytale romance – a love story that is still being written and now includes the birth of a son named Cooper. As the couple continue to perfect their acclaimed vocal blend, the album also explores new sounds like soulful R&B, laid-back reggae and thundering hard rock. Download or stream Thompson Square’s MASTERPIECE in its entirety here. THOMPSON SQUARE is an internationally renowned Country duo created by the husband-and-wife team of Keifer and Shawna Thompson. Since breaking out in 2010 with the 2X-PLATINUM #1 smash “Are You Gonna Kiss Me Or Not,” the duo have gone on to score two Top 5 albums and romantic #1 hits in the U.S. and Australia (GOLD-certified “If I Didn’t Have You” and “Everything I Shouldn’t Be Thinking About”), while also racking up multiple GRAMMY nominations and three trophies as Vocal Duo of the Year from the ACM and CMA Awards. Beloved by modern Country fans, they have earned five Top 20 hits in total, with streaming numbers surpassing 600 million and a social media following of nearly 2 million. Thompson Square have been featured on mainstream TV franchises including TODAY, Fox & Friends, The Tonight Show, Jimmy Kimmel Live!, Conan and CBS This Morning, and have also earned critical praise from Rolling Stone, People, Glamour, Elle, USA Today and much more. After welcoming the birth of their first child in 2016 – a son named Rigney Cooper – Thompson Square have released their third studio album, MASTERPIECE, which was produced by the duo with GRAMMY winner Nathan Chapman (Taylor Swift), perennial hit maker Dann Huff (Keith Urban) and Ilya Toshinskiy. For more about Thompson Square visit www.thompsonsquare.com/, and reach out to them on Facebook, Twitter, Instagram and SnapChat.